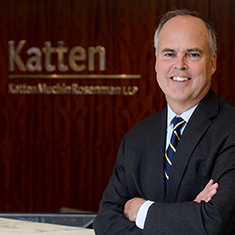 Roger P. Furey is the Chairman of Katten Muchin Rosenman LLP. He has more than 25 years of experience protecting and enforcing intellectual property rights on behalf of his clients. Roger concentrates his practice on resolving disputes involving copyrights, trademarks and advertising and he protects his clients' intellectual property rights around the globe by supervising a network of IP litigators in every region of the world. His IP litigation experience includes trademark and trade dress infringement, copyright infringement and trade secret misappropriation for clients across a wide range of industries, including telecommunications and information technology, automotive parts, industrial batteries, aviation and aerospace, flooring products and defense contracting. Roger has considerable experience representing sports associations in nationwide trademark and copyright counterfeit enforcement programs in connection with major sporting events. In the advertising and marketing arena, Roger represents clients in Lanham Act Section 43(a) and false advertising litigation brought by and against competitors. Roger also has considerable experience handling inquiries, investigations and litigations commenced by federal and state regulators, including the Federal Trade Commission, state attorneys general and other regulatory agencies. His location in the Washington, DC office provides him with ready access to federal regulators, and he has developed strong working relationships with many of them. Finally, Roger regularly reviews client advertising campaigns for compliance with federal and state regulatory requirements, and he is very active in representing clients in advertising disputes brought before the National Advertising Division (NAD) of the Better Business Bureau. Shown below is a selection of Roger’s engagements. Representation of an eye care company in advertising disputes with competitors before the NAD. Representation of a global family-care products company in trade dress and trademark infringement in federal court litigation involving design of absorbent pads. Representation of a clothing manufacturer in potential false advertising litigation in federal court involving Made in USA and other claims. Representation of a telecommunications company in federal court litigation involving false advertising claims brought by competitor. Representation of a global family-care products company in trademark infringement in federal court litigation involving television commercials and other advertising for a home-care product. Representation of a property management company in FTC investigation into alleged violations of the FTC Act and negotiations of resolution for same. Representation of a wireless device manufacturer in FTC and state attorneys general investigations into alleged false advertising involving viral marketing of YouTube video of product demonstration, and negotiations of resolution of same. Representation of an online education provider in connection with FTC investigation into alleged deceptive trade practices. Representation of a vacuum cleaner manufacturer in federal court litigation involving claims of violations of Section 43(a) of the Lanham Act (false advertising). Counsel to a battery manufacturer on compliance with state sweepstakes promotions laws. Representation of Internet domain name registry in federal court litigation involving requests for emergency and preliminary injunctive relief, and appeals, concerning first amendment issues. Representation of sewage aeration system manufacturer in federal court and Trademark Trial and Appeal Board trademark infringement and registration litigation. Representation of private watchdog agency in federal court litigation involving trademark infringement, Section 1983 and first amendment issues.